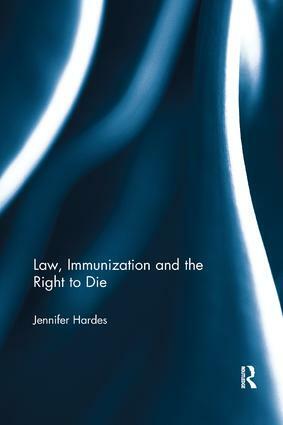 Law, Immunization and the Right to Die focuses on the urgent matter of legal appeals and judicial decisions on assisted death. Drawing on key cases from the United Kingdom and Canada, the book focuses on the problematic paternalism of legal decisions that currently deny assisted dying and questions why the law fails to recognize what many describe as "compassionate motives" for assisted death. When cases are analyzed as discourses that are part of a larger socio-political logic of governance, judicial decisions, it is argued here, reveal themselves as relying on the construction of neoliberal fictions – fictions that are here elucidated with reference to Michel Foucault’s theoretical insights on pastoral power and Roberto Esposito’s philosophical thesis on immunization. Challenging the socio-political logic of neoliberalism, the issue of assisted dying goes beyond the predominant legal concern with protecting – or immunizing – individuals from one another, in favor of minimal interference. This book calls for a new kind of politics: one that might affirm people and their finitude both more collectively, and more compassionately. Jennifer Hardes is a Lecturer in Education at Canterbury Christ Church University. Herresearch examines how legal and medical expert knowledge is constructed and interpreted to make judicial, medical, and broader governmental decisions, particularly regarding policies and laws on health and medical related issues.